Who They Were @ 17. 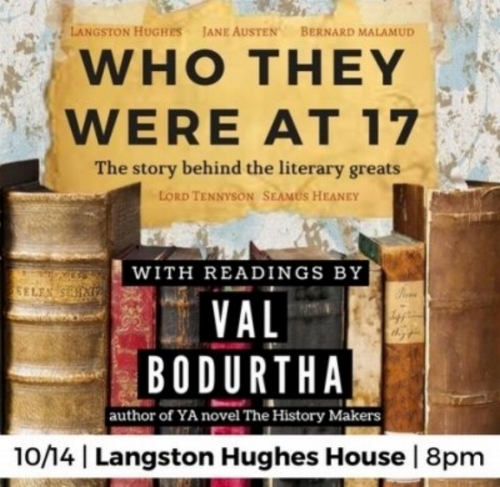 Come to the historic Langston Hughes House on 20 E. 127th Street in Harlem on Oct. 14, from 8 to 11 pm, for some glimpses of the literary giants before they became big. Val Bodurtha, a UChicago senior who wrote her first novel, The History Makers, at the age of 17, will get us rolling along with her friends. They will take turns reading early works from Langston Hughes and other notable authors, such as Jane Austen, Bernard Malamud and Lord Tennyson. Anyone inspired to bring or read samples of his or her own favorite writers at a young age should absolutely feel free to do so. All submissions welcome. Don't be shy! In addition to hosting "Who They Were @17," a free event, Val will have copies of The History Makers available for signing. All proceeds from book sales at this event will go to help the I, Too, Arts Collective, the fabulous nonprofit startup that is working to preserve Langston Hughes' legacy and the historic townhouse he called "home" in his later years. This event is open to the public but RSVPs are mandatory. Please send an email to events@itooarts.com with the names of all attending no later than October 12th.